My beloved tool caddy. This past week I lost my favorite tool (which I did find by the way). This lost tool meant I had to clean and purge my tool caddy. I hadn’t done this in over a year! I’ve really been enjoying writing new color recipes for you this summer. Be sure you check them out. Our free email service The Polymer Notebook has gotten an overhaul. Be sure to sign up for it. Don’t forget to get your copy of the popular Puffed Fish Tutorial! It’s quickly becoming a customer favorite. The elegant Mermaid Tails Pendant Tutorial is new this month is the shop as well, be sure to check it out. Look at the new color palettes I’ve been working on for you! Want to know how I came up with them? Check out this free tutorial here. Crackle is a really awesome technique. Thanks to my craft hoard stash, I came up with a great idea for faux crackle veneers. Make sure you check out this free tutorial. Be still my heart! I love my brushes from TinyPandora. Make sure you grab yourself a set too! Now through Friday (7/28/17) you can get our new 30 Tutorial Bundle Pack for just $99. That breaks down to just $3 per tutorial – WOW! No coupons needed. Check out artist Carolyn Edwards-Tucker amazing sculpts (shown at right). See more of her work and watch her on DeviantArt. Anarina Anar‘s newest person necklace is so colorful you can’t help but love it. See it on Flickr. Victoria Andorina‘s newest Wolf Wizard is so cute and mystical, I just love him. Be sure to click over and view him on DeviantArt. Ralf Toys newest sloth may be the cutest thing I’ve seen this month. Go check it out on Instagram. Check out Alessia Lena’s adorable dolls from polymer that will delight your eyes with color and joy! See it on Flickr. Prefer your clay sculpts a little on the dark side? Check out Colleen Downs work. See her work on Flickr. It’s week 30 of the #2017PCChallenge. How are you doing? Have you joined us yet? Not sure what it is? 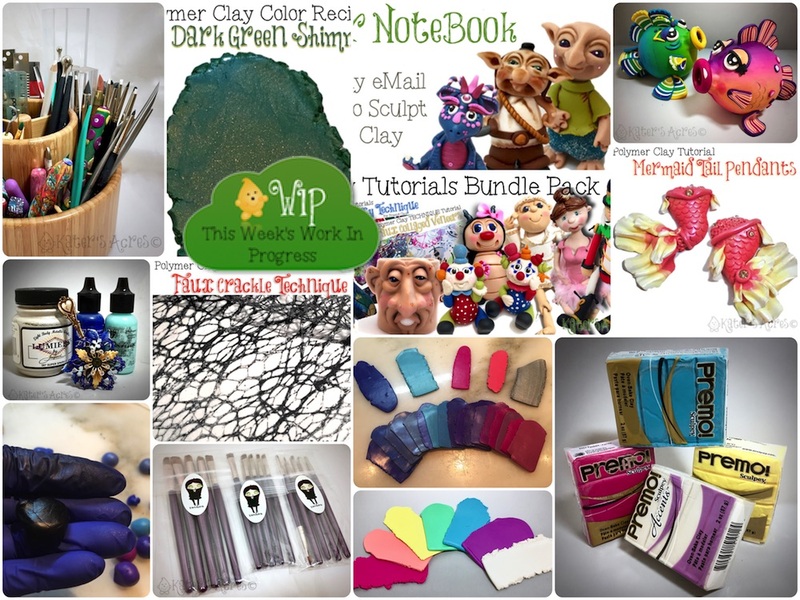 Read about it here and then come on over and join the 2017 Polymer Clay Challenge. Synergy 4 is about to launch in the US. Are you going? Check out the details for all of you planning a last minute trip.